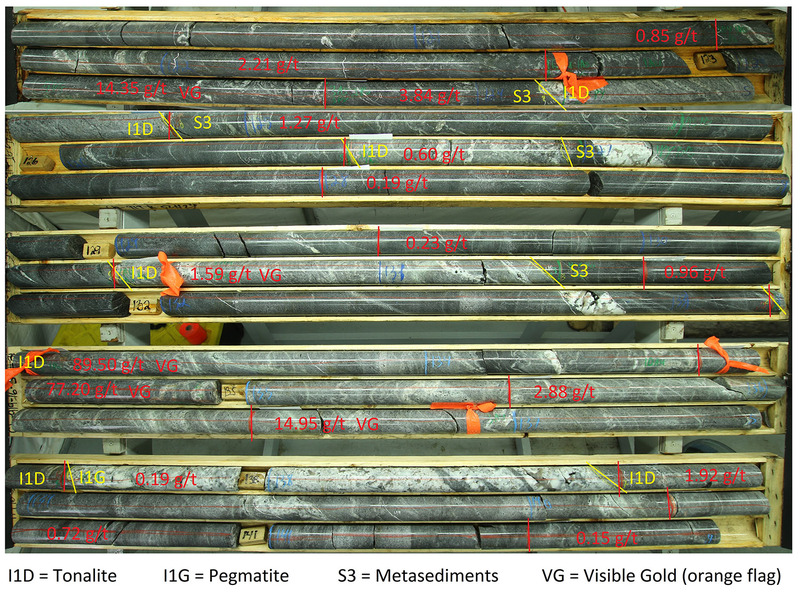 "Following observations of visible gold indicating potentially a significant gold zone in this drill hole, Sirios geologists extracted a series of drill core samples for priority assay. It shows, between 120 m and 140.3 m, a section grading 12.08 g/t Au over 20.3 metres including 48.38 g/t over 4.4 metres (uncut grades, true width unknown). The gold mineralization is distributed in both meta-sedimentary rocks and the tonalite, thus overlapping the contact of these two lithologies. Gold is associated with the presence of numerous folded millimetric veinlets of quartz-feldspar. Only the section between 113.5 m and 147 m was assayed to date in this drill hole, results are detailed in the table below. * Interval along the hole. True width not known. *** Maximum gold grade cut at 50 g/t. ms: Gold grade obtained by fire assay with metallic sieve of a 1 kg sample. The winter 2016 diamond drilling program, started in mid-January, was finished last week with the completion of drill hole #56. Twenty six drill holes (#31 to 56) were completed for a total of 4,179 metres. Assays are completed for drill holes Ext#22, 32, 33, 34, 36 and 37 while re-assays for quality controls are underway for drill holes #31 and 35. 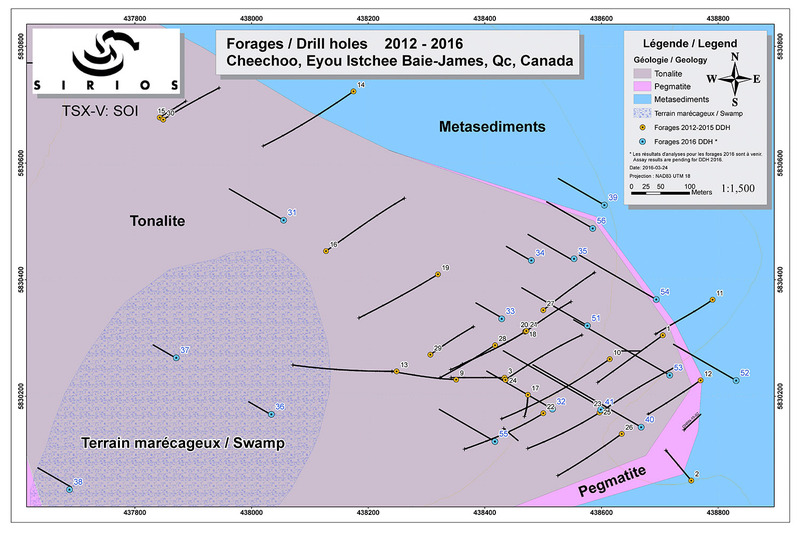 Shallow, less than 80 meters deep, drill holes #34, 36 and 37 yielded only anomalous gold grades. Samples from drill holes #38 to 56 will be assayed in following weeks. Only partial results are known and published to date for drill holes #40 and #52 with this press release and the one of March 7th. NQ-caliber drill cores of current campaign were sawed in half, with one half sent to a commercial laboratory for analysis and other half retained for future reference. A strict QA/QC program was followed by integrating blanks and certified reference materials to the drill core samples, all of which were prepared by IOS Services Géoscientifiques inc. of Chicoutimi, and assayed for gold by fire assay and atomic absorption finish (AA24) by the ALS Minerals laboratories in Val d'Or, Quebec. Samples grading more than 3 g/t were re-assayed by fire assay with gravimetric finish. (GRA22). Samples with visible gold were assayed by pyro-analysis with metallic sieve (SCR24) from a sample of about 1 kg. For the section from 113.5 m to 147.0 m of drill hole #52, twenty-seven samples, of approximately 1 kg each, representing 33.5 m of drill core, were assayed via rush priority for gold by fire assay with metallic sieve (SCR24) by ALS Minerals in Val-d'Or, Quebec."